Back to getting to Canyon de Chelly; now according to the MapQuest directions, it should have only taken 2 and 1/2 hours to get there. Sure it does, if you drive straight through, no stopping; but MapQuest has never driven with Roy and myself. We love to stop and admire the scenery; we love taking photos of where we are and what we are seeing. This post is the continuation of our trek to Canyon de Chelly via Route 191 after crossing the Utah-Arizona border and finally getting to Chinle, Arizona which is where the Canyon is located. As I hinted before, this roadway is going to bring you past miles and miles of formations which will make you think of a miniaturized version of Monument Valley. It was very difficult not to keep stopping every couple of miles to take photos, but if we did that we would never have made it to our designated destination. With all the stopping we did do, time allowed us to only be able to complete the North Rim of the Canyon, so need to go back to the South Rim. Oh, you do not see me complaining about that at all, and am chomping at the bit to get back there again. By the way, there will be a certain point, that if you look off into the distance, you can spy the actual Monument Valley. Another tidbit of information to help keep things in perspective; while driving Route 191 in Utah, you were in San Juan County; once you enter into Arizona, you will now be in Apache County. Apache County has the most land designated as Native American Reservation of any county in the United States. 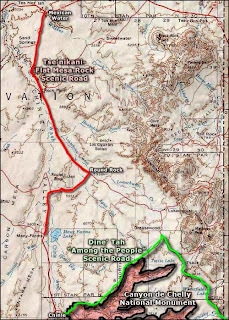 The reservations are, in descending order of area within the county, the Navajo Indian Reservation, the Fort Apache Indian Reservation, and the Zuni Indian Reservation, all of which are partly located within the county. 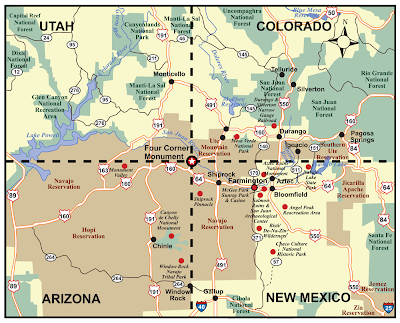 Part of the Petrified Forest National Park is located in Apache County while Canyon de Chelly National Monument is entirely within the county. In other words, when you see a sign saying "Apache County Route #", it does not necessarily mean that you are on the Apache Reservation. After crossing the border, Route 160 is only about 5 miles away; but within 2 miles you'll come up to an interesting formation which I have seen referred to as "keyhole" arches. Remember, I already warned you that signs along this route are slim to none, so this name is only what someone else thought it looked like. It is located in a fenced off area, so while you can park on the shoulder for photos there will be no going up for a close and personal experience. You know you're almost to Route 160 when you see some black mountains with "stone fortresses" around them; well it certainly looks like someone actually built these walls, but it was by natural elements alone. Big hint you have reached the junction of Route 160, almost directly in front of you is the Mexican Water Trading Post; if you need gas, get it as the next station is not until Rock Point. Make a right onto Route 160 and drive until you see the signs indicating Route 191 and Chinle are to the left. If you keep driving straight, you will end up in Kayenta and from there you can travel up to Monument Valley; if you go right on Route 160, you'll either end up going past the Four Corners Monument, or onto Route 64 into Shiprock, New Mexico. Confused, then see the map I've posted up above for reference. Route 191 through Arizona will have many more signs indicating towns or mile markers; signs indicating the names of formations; yeah, good luck with that. Cameras ready? Basically I'll be giving you location details as I've found them; might be the actual town, might just be a mile marker. At mile marker 499, we spied this cave like opening with sandstone that stretched along. Might as well warn you that the shoulder on this highway is pretty narrow for most of the way, so you might have to find a pull in point somewhere and walk back to take photos of interesting areas, or pull off onto the grassy (more weeds truthfully) section. The first sighting in the distance that will definitely catch your eye are of two mesas (one long, one more square like) and that will be around Apache County Route C489. These are called Round Rock and Little Round Rock; I'll post more close up photos of them later on in this post and, yes, that is an arch in Round Rock that you see. Hang onto your seats, here comes another formation with arches on it; Red Mesa Mountain. You know, when these formations are in the distance, they look small, perhaps not impressive at all. That is until you actually come up to them and see how massive they truly are. You get a true perspective of the dimensions when you see a trailer home nearby. A section of the Flat Mesa Rock system. Get ready for something really spectacular, Flat Mesa Rock which you have been basically driving parallel to since Mexican Water. This system of sandstone hills, mountains and formations is 48 miles long, from Mexican Water to Many Farms which includes Rock Point, Rough Rock and Round Rock; dirt roads can be traveled to and within many of the sections. I played with the panorama setting on one camera and was able to get a complete photo from Whale Rock to Los Gigantes Buttes; but I will post individual close up photos too. These pillars were sitting on one of the many ranches seen along Route 191. There will come a point where you'll see a sign to turn right and go towards Rough Rock; you're still on Route 191, so you're doing just fine. The Arizona Badlands will be around you, but you're also coming closer to the mesas I mentioned before, Round Rock and Little Round Rock. Around mile marker 476 is where you'll be able to get awesome shots of Round Rock and Little Round Rock. Round Rock's appearance keeps changing depending on where you are seeing it from. Heading towards Many Farms, you can see the large number of immense spires, walls of pointed fins causing indentations for numerous canyon regions. Remember that arch you might have spied when you first saw Round Rock at Apache County Route C489; there it now is in all its glory. Next stop...Chinle, Arizona; and what many might refer to as the first area of real civilization. No, you've been traveling through civilized areas, they just weren't as built up and modernized as Chinle is. Chinle is large, built up and busy compared to all the little towns you've already passed through; shopping center, restaurants, fast food joints and gas stations. This is pay attention time! You will come to a stop light at a main intersection (a Shell station boarded up will be on the left and you just passed the Burger King area) and you want to be in the left turn lane. Make the left, a Conoco station will be on the right, so you know you're going the correct way; you're now on Route 7. Eventually you will see a Chevron station on the left, keep going straight and there will be a sign stating you are about to enter the Canyon de Chelly National Park. Stop at the Visitor's Center for a map (say hello to Martha who has been a volunteer for 10 years), visit the bookstore, restrooms or look at the photo display in their museum area; and this is where the story ends...for now. Normally traveling to Monument Valley, or even into the state of Arizona, means going south on Route 191 to Bluff and then continuing on Route 163. So what happened to Route 191 you might ask; then again you might not even care. Being curious adventurers, Roy and I decided to find out what the southern extension (built in 1981 - 1982) had to offer in sites; we had not traveled it before and there's a first time for everything. Route 191, depending on the map you use, is also known as "Bluff Road" or "Mexican Water Road"; Mexican Water is the name of the town you will come out in when you eventually reach Route 160 in Arizona. 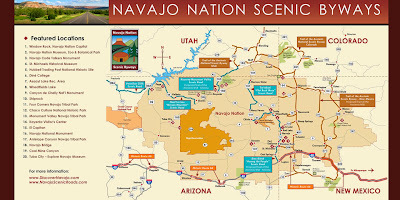 Bluff itself is not part of the Navajo Nation, but you will soon cross over into it. Now many of the roads are Country Roads (sign has a CR with a number), County Roads (sign has a SJC with a number), and you will still see signs for old "Indian Routes" (sign has Indian Route with a number); and then there are the roads with no signs at all. Now after living in Lancaster, Pennsylvania for about 19 years, I understand how the Amish and Mennonite like their privacy; they're people who follow a different culture, they're not "things" for sightseeing. The same goes for the Native Americans and the Reservations; it is homeland for their culture, and the people are not part of the tour unless you have been personally invited. So, unless you know for certain that a road leads to a site open for public viewing; well, if in doubt, stay out. After turning onto Route 163, you'll sort of think, at first, this road looks boring; that thought won't last very long as you suddenly come up to sheer sandstone walls reaching up into the sky. Hold onto your heads as they'll be turning from side to side to try and get all the sites in. At one point you'll cross over the San Juan River and its sandy shore. Now what I didn't know at the time was that this section of Route 191 runs parallel to Comb Ridge. The indentations of the ridge (as seen from above and partial frontal view) mimics the structure of a comb, hence the name, and on our to-do list of course. Anyway, the outward views from the road are pretty awesome to see. Oh, before I forget, mile markers are pretty much non-existent on this stretch of roadway; so if you're one of those drivers who needs to know exactly where everything is, you're out of luck. Just relax and drive, you'll find it eventually. I can tell you that once you turn onto Route 191, you're about 26 and 1/2 miles from Route 160 in Arizona; yes, I said "about", relax and deal with it. Once in a while you will see a road sign that will give you how many miles you're away from something. This photo of one of those signs tells me that the scenic shots I took were about 4 and 1/2 miles from the turn-on to Route 191. Does the mesa seen in one photo have a name? No clue - no signs, no names listed on maps; basically not every formation has a name out here, since there are thousands. Do you realize how large a book of maps would be if every rock formation was named and pointed out on a map!!??!! Along the way I made Roy stop the SUV to get a photo of some adorable looking creatures - three burros. Now I have seen many a light gray burro, but these were white and dark gray to black. I was entranced with how adorable they looked, and Roy smiled because this simple pleasure was so exciting to me. He named them, what else, The Three Amigos. Now this last photo was of an intriguing formation that became more and more mysterious looking as you got closer. Considering we were looking eastward and the sun was in full brightness; it caused an intense shadowing effect on the dark stone. I looked on the internet for many an hour to try and identify it; from written geological reports I ascertained that this is more than likely "Boundary Butte". I found photos of "Boundary Butte Mesa" which is further east of this formation, same type of rock, smaller in size and having an arch within in. It was so named due to its proximity to the Utah-Arizona border, so once you see this formation, you know you're almost to Arizona. I live in southeast Utah which is part of the Four Corners area. What exactly does that mean? 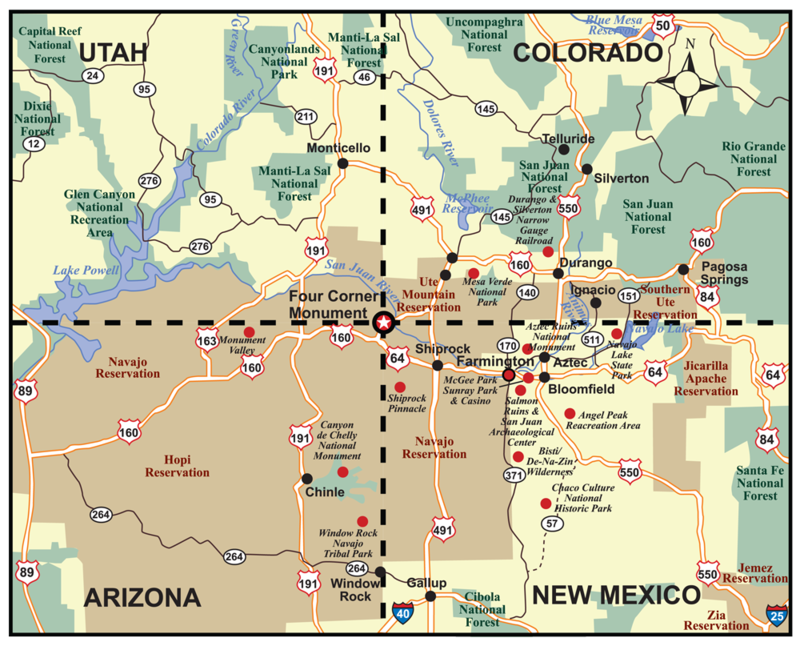 The actual four corners are where the boundaries of Arizona, Colorado, New Mexico and Utah meet; no where else in the United States does this occur. The dispute over the borders goes back in history prior to the Civil War; when the United States was warring with, not only the Native Americans, but Mexico over territory. In 1875 a stone shaft was embedded in the ground to mark off the final survey, but it was not until 1912 that the area was enclosed with a cement shield; a brass plate was set in the center in 1923. Several times the cement area cracked, even the brass plate broke; 1992 an elevated cement area was built with an aluminum-bronze plaque set in the center. Guess what? In early 2009, a survey was published stating that the plaque was in the wrong location and needed to be moved 2.5 miles west. 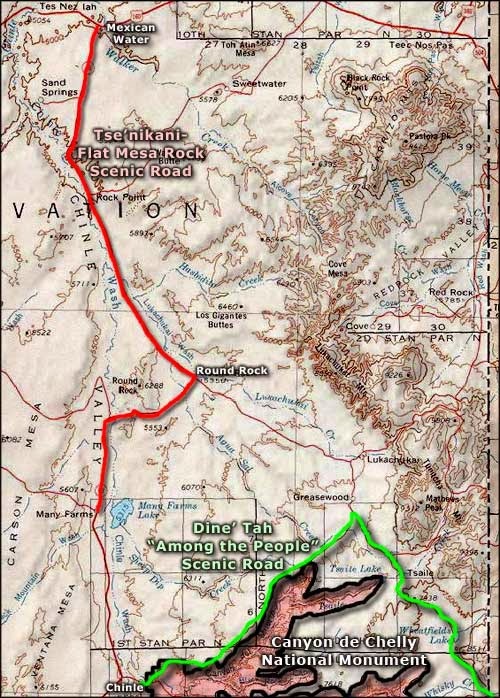 The BLM and Navajo Nation got involved and it was definitely determined that it was slightly incorrect; only .34 of a mile off center and needed to be moved east, not west. So, in 2010, the entire Monument area was rebuilt; elevated pad was removed, plaque set in the correct place with four other plaques set around it in dedication to the four states. An elevated viewing and seating area was built around the plaque area; the vendor stalls were rebuilt with cement and stone, so no more rickety wooden ones. Instead of parking directly in the Monument area, there is now a parking lot outside where you can enter from the Arizona side, or walk around the outside and enter through one of the other states. The various vendors, representing their home state, sell souvenirs of the Monument itself, or of the state; Native American arts and crafts are beautiful and you will find it very difficult not to purchase an item from a vendor in each state section. There are a few vendors who sell Navajo Fry Bread, so look forward to this treat. Now walking around the exterior of the Monument, the landscape stays pretty much the same: sandstone hills, desert, sagebrush, cacti; if you're lucky, a herd of wild horses could be grazing, or even walk into the Monument area itself. The roadway to the Monument is off of Route 160, the Arizona side; there are signs, so you cannot miss the turn. There is a fee of $3 per person (not vehicle); this is a Navajo Nation Tribal Park, so National or State Park passes are not accepted. Did Roy and I stand on the center plaque? Of course we did! Did we feel a disturbance in the force; did we have a spiritual awakening? No, but it was cool to do; we now have bragging rights that we did go there, and we did stand on four states at the same moment.